Where is Winchester gun safes made? This is one of the most popular questions on the minds of gun owners on a hunt for top-level safes with world-class security features for storage of handguns or long guns. Winchester is an iconic brand noted for the manufacture of 5-star safes. From small handgun safes with top of the range features priced at hundreds of dollars to large security vaults with enormous anti-burglary traits, Winchester gives you so many options. No matter the number of guns you own and the type of security you are looking for, there is a perfect Winchester model out there for you. Taking your time to research and choose the most suitable one is the only catch. Well, it looks like we deviated for a second and got into other stuff which does not directly answer your question. Now let’s take a detailed look at the question again. 1 Where Are Winchester Gun Safes Made? 1.2 Are All Winchester Safes Made in the USA? Until recently, 100 percent of Winchester gun safes were manufactured outside the United States. While the company produced its safes in the country initially, the company’s leadership found the trend of moving production overseas too hard to resist. This was to help the firm cut down costs and safeguard profits. Things seemed to be going on well in that regard. However, there was just one remaining problem. In spite of the sophisticated security features and innovative designs, patriotic Americans were overlooking Winchester models in favor of Made in USA safes from rival companies. They were opting for Fort Knox, Liberty Safes, and other brands whose production factories are located stateside for sentimental reasons. After detailed investigation into the reasons for their dwindling sales and consumer feedback, the owner’s of Winchester’s parent company realized that they were shooting themselves in the foot by manufacturing all of their models outside the country. In January 2013, Granite Security Products Inc., the parent company behind Winchester Safes released a mind blowing piece of news. It announced that the company’s factory based in Fort Worth, Texas which had been closed decades earlier was being re-opened for production. Not only that, the factory had also undergone significant investment worth hundreds of millions of dollars in order to upgrade it to the highest manufacturing standards. The firm announced that the latest Bandit, Pony, and Deputy Series of safes were to be manufactured in the United States. Additional Series of its product line have also been added to the made in USA models within the last couple of years. Are All Winchester Safes Made in the USA? The short answer is no. Winchester still manufactures some of its models outside the country. However, the majority of its high-end safes costing thousands of dollars are made right here in the Texas factory. But, how do you know which safes are produced in the country? Winchester makes this easy for you by conspicuously emblazoning it with the “Made in USA” tag. You can also log onto the manufacturer’s website and click on the “Made in America safes” link. This grants access to the list of Winchester safes produced in the United States. 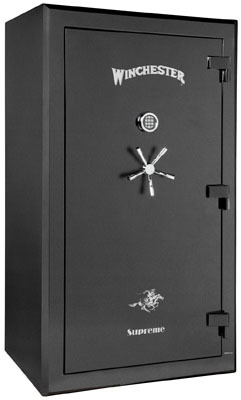 Winchester has a wide range of Made in USA safes and gives you lots of options when it comes to top security models to choose from. As long as you are looking for a durable safe that keeps your guns, ammo, and valuables safe, Winchester will always be a great option. 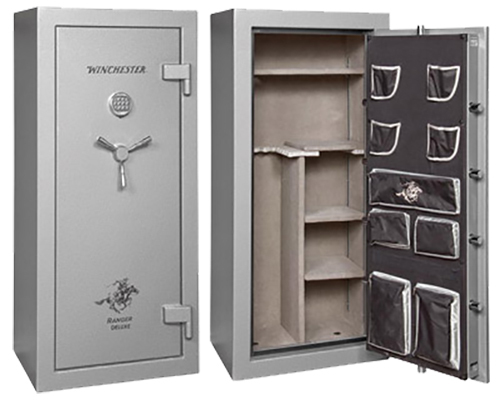 In recent times, the Tradition series has also been added to the Winch﻿ester’s range of ﻿Made in America safes﻿.